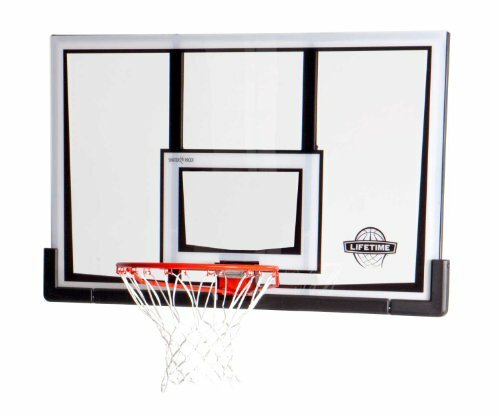 This backboard combo from Lifetime Products features a 52" Steel-Framed Shatter Proof Backboard and an orange Slam-It Rim. The backboard has a clear, shatter proof playing surface that gives you the look and play of pro-style glass. The powder-coated steel frame improves rigidity and rebound, and the UV-protected graphics will not fade or peel over time. The 18" Slam-It Rim is made of 5/8" solid steel with 1/2" steel braces and double compression springs includes a heavy-duty nylon net. The Lifetime backboard and rim combo is ready to replace the backboard and rim on a current Lifetime system. A universal mounting bracket is sold separately for mounting your Lifetime backboard directly to a roof, eave, or wall. 52" x 33" x 1" Polycarbonate Shatter Proof Backboard gives you the look and feel of the professional game! Universal Mounting Bracket (sold separately) provides solid attachment to roof, eave, or wall.